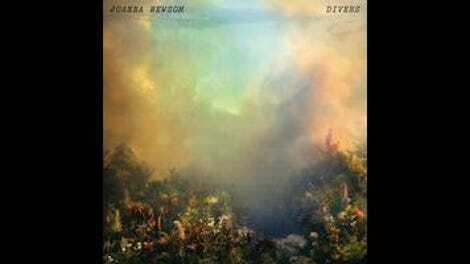 Listening to Joanna Newsom’s newest record, Divers, feels like taking a wistful stroll through a field overrun with vibrantly colored wildflowers. The overwhelming sense of beauty that surrounds you as you take in song after song is both real and palpable. With so many different sonic textures working against and in concert with one another, you inevitably find yourself getting lost in a hazy dream state between the waking world and the one that she has created out of thin air. It’s ethereal in the most literal sense of the word: light, airy, and elegant. Divers doesn’t have the same sort of scope of Newsom’s last release, 2010’s triple-disc Have One On Me, but it in no way lacks for grandeur or spectacle. The multiple, multifarious layers of pianos, stringed instruments, guitars, and drums blend together to create a stunningly beautiful full-on pop symphony. That being said, the simple combination of Newsom’s harp and feathery voice—a unique hybrid of Joni Mitchell and Nina Simone—remains the bedrock for each song and the heart of the record as a whole. Newsom’s artistic lineage isn’t difficult to track. Centuries of English, Irish, and American folk music informed a modernist revival in the 1950s and ’60s spearheaded by the likes of Woody Guthrie and Pete Seeger, before being taken up by Bob Dylan, Simon & Garfunkel, Fairport Convention, Crosby, Stills & Nash, and the aforementioned Joni Mitchell. That Newsom’s able to bring freshness to such a musty, overwrought field is a true testament to her contemporary and beguiling sensibilities and instincts, as well as the sense of life that she imbues into each and every song. The sheer array of sounds on this record is amazing—not just in the variety of instruments employed, but also in the ways they are utilized. Clean guitars, such as the Richard Thompson-reminiscent tone found on “Goose Eggs,” are alternated with overdriven screamers like the one heard on “Leaving The City.” Harpsichords mix with synths or sub out for keyboards and run-of-the-mill pianos. Even the drums are used in a number of interesting ways, from songs dominated by loud, crashing snares and cymbals to ones inflected with sparse, sweeping toms and hi-hats. “Time, As A Symptom” is a prime example of the attention to detail paid to sonic construction during the recording process, opening with a single bird call that eventually gives way to a series of intertwining voices, luscious drums, and a full horn section. The title track also follows this dynamic, beginning with just Newsom’s harp before weaving like a snake across seven minutes and into a variety of musical trapdoors and false hallways. But Newsom’s signature harp never sounds as light, vibrant, and plucky as it does on the mournful “You Will Not Take My Heart Alive,” a song accented by sparse but lively synth lines. Her fingers dance at an almost gleeful clip across the multitude of strings stretched out before them in a manner that seems truly at odds with the sorrowful core of the song’s message, giving it a hopeful, uplifting tone that can be somewhat difficult to reconcile. It might just be the best song on Divers.